Hello, my name is Dominic Sembello, L. Ac, MSOM . I am a practicing acupuncturist in Linwood, treating infertility with Acupuncture and helping women increase their chances of getting pregnant by as much as 50%. I want to thank you for visiting our website, and in return I would like to offer you a coupon for a FREE Initial TCM Exam and Consultation ($85 value.) 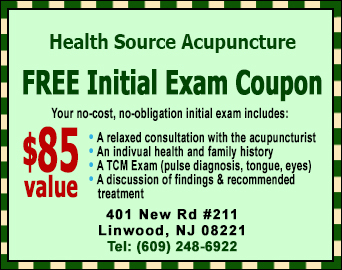 This coupon is good for one initial TCM (Traditional Chinese Medicine) exam and limited to one coupon per person. If you, your friends, relatives or colleagues are ever in need of our services, please click on the coupon to download it and bring it with you on your first visit. Want to know if your insurance covers acupuncture? – Click on the insurance logos below to verify your insurance and we’ll let you know. If you have any questions send me an e-mail or call us at (609) 248-6922. I’ll be happy to answer your questions and discuss your concerns. -- Dominic Sembello, L. Ac.